I thought it would be helpful to create a resource page that you can always come to for all of your innovation and business tool needs. Each time I come across something that looks helpful, I’ll add it to this page. I recommend bookmarking it for your reference and convenience. Enjoy! Disclosure: A few of the links listed below are affiliate links. If you decide to purchase from those links, I will receive a small commission at no extra cost to you. Please note that I recommend those products because I have have found them to be helpful myself, not because I could earn a commission by telling you about them. I would not want you to spend your money on anything that would not be helpful towards achieving your goals. LeanStack: Ever since the Business Model Canvas was introduced as a downloadable pdf I thought “Why isn’t this on a website as an interactive software package?” Well with a few tweaks and their own take on the canvas, that’s what Spark59 has done with LeanStack. Balsamiq: A simple and quick way to create wireframes for your new website or software idea. InVision: A third wireframing application that has a heavy emphasis on mocking up the final look, feel and function of your new application. It’s a great choice if you have graphic designers who are able to quickly create UI designs. Axure: Another great way to create quick UI prototypes. Unlike Invision, Axure runs locally on PC or Mac and allows for quick changes and re-use of elements in the design. It’s design and prototype all in one app. Principle: Principle is another great app prototyping tool which does both UI design and animated prototyping in one. It’s only for Mac so if you’re on PC probably better to stick with Axure but if you’re on Mac I prefer Principle. TechShop: Techshop is an open-to-the-public workshop. They have everything you need in order to bring your hardware idea to life. Whether it’s a 3D printer, laser cutter, wood shop or metal work shop, at TechShop you can design and build your idea all in one place. Customer Journey Canvas: A great way to model a customer’s experience for service based organizations. IDEO Human Centered Design Toolkit: This is THE ultimate source for how to execute a Human Centered Design innovation initiative. Note: signing up for their website is required to download. It’s worth it if you’re serious about doing human centered design. Metrics For Innovation by Strategos: If you’re struggling to figure out how to measure the performance of your innovation efforts, check out these metrics from Strategos. Business Excel Templates by Chandoo: Chandoo is an Excel guru who has created a fantastic set of Excel courses and templates. I particularly like his dashboard templates but there are all sorts of excel templates available here. Game Theory 2×2 Excel Solver: This solver is a great tool for a quick and easy way to find out the solution to a 2×2 game theory problem. 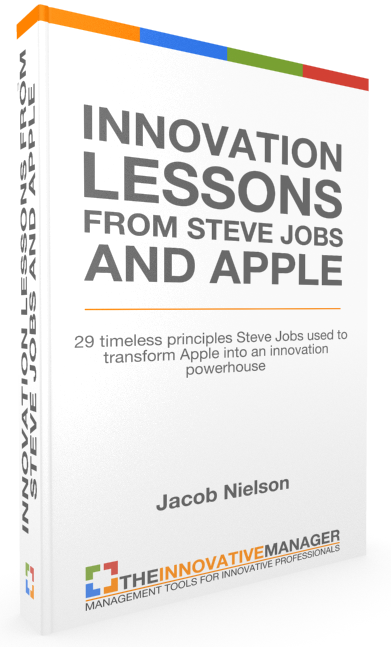 Steve Jobs by Walter Isaacson: No matter where you are in your innovation journey, this book will inspire you and give you insight into how and why Steve Jobs was such a successful innovator. The Innovator’s Dilemma by Clayton Christensen: This game-changing book is a must read for those wanting to truly understand the concept of disruptive innovation. The Innovator’s Solution by Clayton Christensen: In this book Christensen introduces the concept of “jobs to be done” and uses it to help you know how to innovate yourself out of the “dilemma.” If you only wanted to read one of the above two books, read this one. He includes a summarized explanation of the first book in this book as well as providing the solution. What Customers Want by Anthony Ulwick: This is a fantastic resource for getting the full scoop on how to apply jobs to be done thinking to your business. I view this as the real meat behind the solution that Christensen refers to. As the original father of jobs to be done, Ulwick goes into in-depth detail on how he has helped companies innovate using his patented process. Mastering Lean Product Development by Ronald Mascitelli: Mascitelli is not as well known as Ulwick or Christensen but his method is excellent. His event-driven approach to NPD is the best way to execute NPD processes that I’ve ever come across. He explains swim lanes, must/should/could requirements and a host of other great tools for innovation. The Myths of Innovation by Scott Berkun: Scott Berkun worked at Microsoft in charge of Internet Explorer. Whatever your feelings are about IE, don’t confuse them with Scott Berkun because this book is a fantastic read and provides real insight into what it takes to innovate. The Lean Startup by Eric Ries: The Lean Startup is a great resource for entrepreneurs and innovators primarily because of the emphasis on continuous learning – the key to startup success. Blue Ocean Strategy: This book is what started the Blue Ocean movement. Chan Kim and Renee Mauborgne have developed a solid framework for thinking through innovation and competitive analysis. The Innovators DNA: This book is a great resource for understanding the types of characteristics all the great innovators have and how to develop them in yourself. 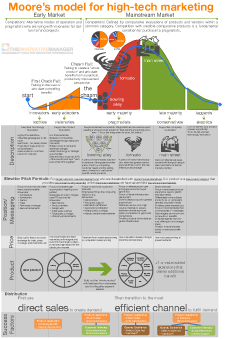 Lean Analytics: A fantastic read on how to create and track innovation metrics. Lean Branding: A great how to guide on creating a memorable brand for your new idea. The Four Disciplines of Execution: A guide to focusing on what matters and how to execute day in and day out. Steve Blanks Customer Discovery Checklist: Steve Blank is a widely respected startup advisor in Silicon Valley. In this set of short videos he walks you through his process for customer discovery including how to reach out to people, get their feedback and iterate based on that feedback. 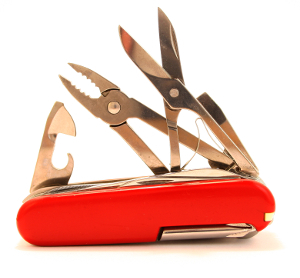 MIT OpenCourseWare – Managing Innovation and Entrepreneurship: I came across this material several years ago and I still highly recommend it. It covers some concepts that are fundamental to innovation and entrepreneurship such as technology S curves, various innovation strategies, etc. Wired – Straight Dope On The iPod’s Birth: This story is THE ultimate example of how connecting the dots really works. Though a little old, the principles the story illustrates are timeless. Fortune – Steve Jobs Speaks Out: This is a great summary of quotes from Steve Jobs regarding some of his most successful products such as the iPod, iTunes, etc. The Influence And Value of Analogical Thinking During New Product Ideation by Darren Dahl and Page Moreau: This paper is fascinating. I’ve always loved analogies and this paper opened my eyes to how valuable making analogies can be to new product success. Wendy Kennedy International: Wendy Kennedy’s “So What? Who Cares? Why You?” framework is featured in my free ebook as one of the best ways to clarify your innovative idea and properly think through it. I have used this framework in presentations to senior leaders myself and have found it to be extremely helpful. Clayton Christensen’s Key Concepts: A great source of all things related to disruptive innovation and Clayton Christensen’s theories. Geoffrey Moore’s Zone to Win LinkedIn Articles: The articles that Moore wrote which he later compiled into a book called Zone to Win. These are a must read for any business leader facing disruption. Vitsoe – Dieter Rams 10 Principles For Good Design: When you get to the root of it, Apple has Dieter Rams, not Steve Jobs or Jony Ive, to thank for their incredible design prowess. Ive, Apple’s chief designer, studied under Rams and was indoctrinated with the concepts that created such beautiful and simple products. This is a must read for those who care about good design. Stanford D School: Take a crash course from one of the best product design schools in the world. If you want to learn about how Silicon Valley product leaders work their magic, this is a great place to start. Annie’s Studio: Annie Wang is a gifted interaction/UX designer based in San Francisco. She’s crafted simple and beautiful interactions with several leading Silicon Valley companies including Survey Monkey and Intuit. I love her site because she has a fantastic infographic on her Lean UX design process. Interaction Design Foundation: This is a great website for learning the amazing field of interaction design. The best part is you can browse the articles and textbooks for free! Brand Deck: This simple but powerful deck of cards can help you clearly and succinctly define your brand identity.